Free family fun from the good fun loving folks at the Carnegie Library of Pittsburgh! Kazoos will be provided, but you may BYOK (Bring Your Own Kazoo) if you wish. We’ll practice our standard repertoire then open the program to requests. 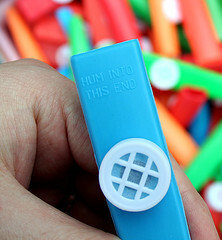 ANYONE can make music with a kazoo, so . . . “Pucker up and party!” This free program is for all ages. Bring the whole family.